It's Grand National weekend, with the most exciting date in the UK horse racing calendar taking place tomorrow. The four-and-a-bit mile race sees jockeys and horses hurtling around two laps of the Aintree Racecourse, jumping 30 fences along the way. And it's got a new big fan: Amazon's Alexa. 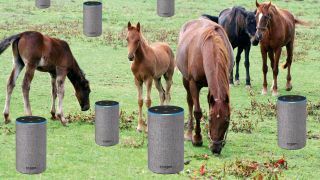 If you get chatty with Amazon's voice assistant on your Echo speaker this weekend you'll find it's been updated to answer a whole host of questions on the race and its history – though you might not want to rely on Alexa for a tip to find the winner. Q. When is the Grand National? Q. Where is the Grand National? Q. Who won the Grand National last year? Q. Who won the Grand National in 1862? Q. Which jockey won the Grand National horse race in 1968? Q. How long is a furlong? Amazon promise that there is plenty more you can ask its assistant in relation to the race – more than enough info for you to be able to fake expert knowledge come the final furlong.